The world is a fascinating place. Let's play here. Your collection starts with four free scavenger hunts: Out to Eat, I Can See A to Z, Detective Story, and Zoo Adventure. Someone's Favorite: Ask the favorite food of someone at your table. Mixed Media: Find a work of art made with two or more materials. Geared Up: Find a machine that uses gears. My Dance Move: This is my dance move. Challenge Clue: Ask someone to teach you a new game and take a picture playing it. Stuck on a clue? No problem! Clue hints explain tricky vocabulary, prompt with ideas, and guide kids to find solutions. 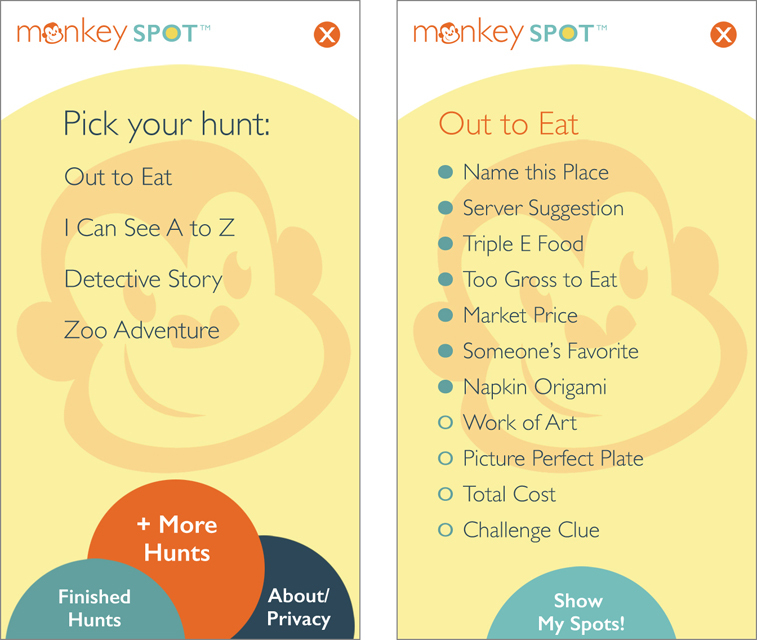 There are no right or wrong answers in Monkey Spot, inviting kids’ inventive solutions. When you’re all done with your hunt, share your spots with a slideshow! Add more hunts from our ever-growing library. Additional hunts include Look in a Book, Backyard Nature, Playground Challenge, Airport Explorer, Go Go Grocery Store, and more! Play Monkey Spot at the New York Hall of Science, and look for it at other museums coming soon. The world is a fascinating place. Let’s play here!